Amid Violence In Baghdad, A Musician Creates A One-Man Vigil Karim Wasfi, conductor of the Iraqi National Symphony Orchestra, has been playing his cello at the sites of deadly attacks across the capital. 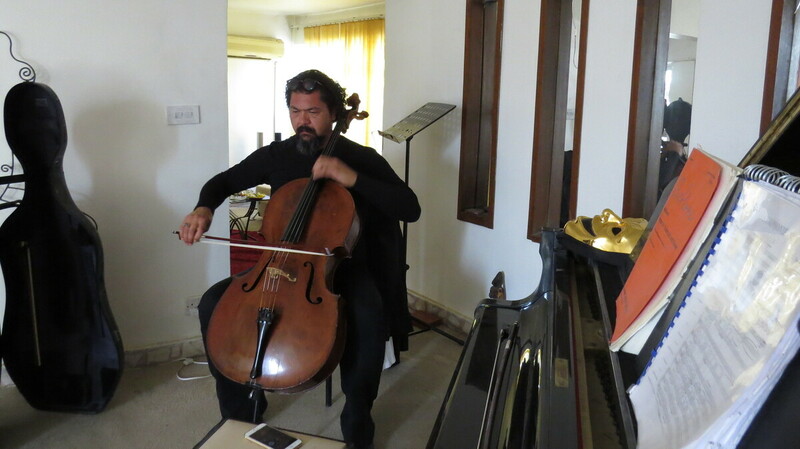 Karim Wasfi, conductor of the Iraqi National Symphony Orchestra, at his home in Baghdad, has been playing his cello at the sites of explosive attacks in Baghdad. The roar of a car bomb has been the prelude to Karim Wasfi's performances of late. The renowned conductor of the Iraqi National Symphony Orchestra has been appearing at the sites of explosions across Baghdad. Just hours after attacks, Wasfi can be seen seated amid ash and rubble in a black suit jacket, long hair combed back, playing his cello. For him, this combination of music and place has become a form of resistance, something he told Morning Edition when the show reached him at home in Baghdad. "This was an action respecting the souls and the spirits of the fallen ones due to terror around the world — and, of course, Baghdad, because we're living the reality over here," Wasfi says. "The other side chose to turn every element, every aspect of life in Iraq into a battle and into a war zone. I chose to turn every corner of Iraq into a spot for civility, beauty and compassion." Wasfi resides in a well-to-do neighborhood of Baghdad called Mansour, once an enclave of diplomats and private clubs. A deadly attack in Mansour a few weeks ago, an explosion Wasfi narrowly missed, prompted him to take his cello to the streets. Wasfi's close friend Ammar al-Shahbander posted footage of that first performance, in which he performs an original composition titled "Baghdad Mourning Melancholy." In the video, a man in a wheelchair rolls up slowly right next to Wasfi, taking in the unusual moment, while others gather to watch and listen. "Some soldiers were in tears, some shop owners were in tears. Some people were confused," Wasfi remembers. "I was connecting everything: death, spirits, bodies, life. People were supportive. They were appreciating the fact that someone can still at least lead their emotions and spirits towards something beautiful, to rise above the intimidation of improvised death." The video went viral, broadcasting Wasfi's music and message beyond Iraq. His next performance came after a tragedy that affected him personally, when al-Shahbander was himself killed by a car bomb attack. The next morning, Wasfi put on a full white suit and grabbed his cello again. "Unlike what people think, we have a choice of fighting back," Wasfi says. "We can't just surrender to the impending doom of uncertainty by not functioning. But I think it's an awakening for everybody to make a choice and to choose how they want to live, not how they want to die."